A Year of Being Here: Hilda Morley: "New York Subway"
from us what we had learned from each other. "New York Subway" by Hilda Morley, from To Hold My Hand: Selected Poems 1955-1983. © The Sheep Meadow Press, 1983. 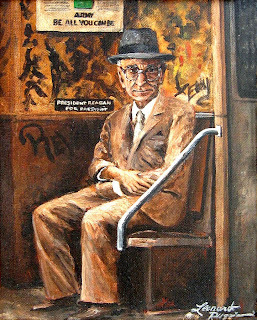 Photography credit: "Old Man on Subway," acrylic on canvas, by Leonardo Ruggieri.